I like your idea of a fabric covering to germinate carrot seeds. I use a really long piece of styrofoam I got in a box-keeps the soil moist till they come up. Fabric is a great idea for LONG rows. As much as we love carrots, I need longer rows!! What a great idea. And I’ve never heard of Touchon – I’ll have to give them a go next year. Sue: For years, the Earthway seeder was the only one widely available and affordable for tiny farming. There’s even a drawing of it in Eliot Coleman’s 1990’s veggie grower “classic”, The New Organic Grower. But it really overseeds most crops. There are only 11 seed plates, each with a fixed hole size, to cover all garden veggies, so you don’t have much control. On top of that, seed isn’t always the same size from batch to batch, even for the same variety from year to year. Over the last 4-5 years, a few other, more precise seeders have hit the market. And there are old ones, like my antique Planet Jr., that do a much better job than the Earthway. But the Earthway is light, quick, convenient, it’s easy to reach for! Hand seeding tiny seed, you could try “cutting” the seed. Find some inexpensive seed of a similar size and shape, even rice can work for some things, make sure the seed is dead, like bake it for a bit, then mix it in! That may be a bit much work for you, and I’ve never actually tried it, but I’ve been meaning to for the Earthway. I am volunteering as intern on a farm this summer that has a Jang Precision seeder. It really deserve its reputation: the seeding rate of pretty much everything that was direct-seeded is perfect. They have done exactly zero thinning. Considering how time-consuming (and thus costly) thinning by hand is, it is worth every dollars. You should really consider it, Mike. Perhaps borrow one from another grower to try first? Also consider where your product is made. The only plastic part on the Jang is the seed hopper; the rest is all metal. You would have to be pretty abusive to break that! I have used the Jang for three seasons now. My opinion of it is a lot more nuanced than it used to, but still positive overall. The price is obviously the biggest downside. The adjustments are also not entirely intuitive, and takes a lot of fine-tuning to get right (the depth adjustment, in particular, is quite backward to use). Singulation of small round seeds (such as most brassicas) is absolutely perfect. It works fairly well with coated seeds, although you have to open up the chute a little more so singulation will not be perfect. It does an ok job for irregular seeds (raw carrot, beets, spinach), and is completely useless for the larger seeds such as beans and peas. In fact, I am buying an Earthway just for peas. BTW, you would not need the whole set of disk. I own five, and the X-24 is what I use about 80% of the time. Thanks for the insights from your direct experience, for sure. Have made a conscious effort to leave blog comment world and actually get some work done, recently. I am helping several other growers doing their direct seeding. Not a lot always happens with early direct seeding here as the soils can still be quite cold late into May. We put in 1K feet of sweet corn on May 27 and about only about 10% germinated even with perfect soil moisture content and normal average daily temps. Pjr spacing was about 4 inches on the corn that did sprout. We will be reseeding the corn this afternoon. Having the Pjr planter for not quite a year now, I am impressed. Beets, spinach, radish, chard, peas, small trials of hull-less barley, cereal rye, buckwheat and wheat, also cucumber and parsnips, dill ( one needs to keep the hopper full enough with extra seed so that the agitator is still stirring up some seed at the end of a row, with these flat, more irregular seeds) 7 different gardens, from fairly rough to finely prepared and raked, the Pjr seems to be fine with it, from field reports coming in and requests for help with succession plantings. Fifty feet of carrots is taking its time to germinate, but my trial drop was about 20-30 seeds per foot. First signs of the carrots germinating was last evening, planted June 4. I do so appreciate the accumulation of knowledge and tips presented here. Thanks. I am having 1000m2 field on which I intend to sow buckwheat and barley. Can you tell me which seeder do you own and use for sowing buckwheat – Planet JR seeder? Or some other? Is it still possible to buy it somewhere? I used a broadcast seeder for buckwheat, there’s photos of it on this blog if you search or check tags. Mine was an over-the-shoulder model that you walk around with. For 1000sqm, if the ground has been prepped so you can use a seeder, you could use a Planet Jr or Earthway, it’s a bit of walking up and down, but you get more control. I plan to eventually get a Jang, having read the endless good reviews, and knowing a couple of growers around here who have em. I’m not rushing, though, as I get increasingly used to my antique Planet Jr. The more I use it, the less I adjust and fine-tune, both the depth and plates, which is kind of interesting – Bob (lifelong farmer) said he left the depth at one setting for everything and basically used a small-medium-large approach to the many seed hole choices. I like that! I also have an Earthway that I use when I want to…overseed, mainly now for lettuce for salad mix and sometimes carrots. Also, I have a couple of Earthways and they’re great for cover crops, two people can do quite an area and works better than broadcasting. I used to be a big fanboy of the Jang, but as I wrote above, my opinion is now a lot more nuanced. It’s good for certain things, and not so good for other. Before you plunk down 500$, consider borrowing one first, to try. If it is not a significant improvement over the Planet Jr, perhaps your hard-earned dollars would better be invested somewhere else. I know what you mean exactly. There are no magic wands, some tools are great in comparison to others, but no one or two or three fantastic tools are going to offset all the variables you can’t control, and as you get used to each tool, and find workarounds for its shortcomings, if it’s half-decent, you can coax fairly great performance out of it. It all evens out. :) The more you know, the less you need. I read a farm blog where they described how every seed they plant is pelleted and placed by hand, and how the near perfect germination and spacing more than offsets the amount of upfront time spent compared to a seeder. I’m sure…but no freakin’ chance. Many ways to get the same job done well. I usually wait until the thinnings are big enough to eat, no point in wasting perfectly good food. Great idea to use a cover to germinate the seed. I will have to give it a go. I also have a massive problem with thinning, but usually because my fumbling hands are not delicate enough to sow thinly in the first place! I try and offer the thinnings as food for the rabbits (pets) – they love them and it saves us a bit of money on buying extra greens. Trouble is, with my eastern British climate (hotter summers, colder winters), this is definitely a seasonable ‘benefit’. I’m with Melanie. I think them out and eat the little carrots. I have tried cheesecloth and other covers but I will have to give something heavier a try…I’m tired of one or two use covers! Thinning is not my favorite but it beats not having enough in the rows. I like the use of the cover – as far as thinning goes – it is unproductive. I use the Earthway for larger seed such as corn, beans, etc. When it comes to to precision seeding I have adopted the six row precision seeder. Last fall I had two 100′ rows of the most intensively spaced crops that I have ever had to include lettuce, carrots, beets, chard, etc. It does require bed prep – but the yield was well worth the effort. As a side note – once they had germinated there was virtually zero weed competition. I live in Ohio with a pretty clay based soil and if it can be done here – I would think it could be done anywhere. I studied your postings on this seeder before buying and was leary – but with the work I have done on my beds – it was well worth it. Have not had an opportunity to try the Jang. Just some feedback from my experience. Good luck with the rest of the season! With rooftop farming growing in use, it won’t be friendly alien nurses nor care-givers you’ ll need to invite to America but our green-thumbed domestic helpers. We have one in our home here in Manila who’s a marvel and she’s consulted by our condo neighbors on rooftop and indoor plantings. Greening is her passion. You might consider sewing a sleeve along each side of the cover and feed through a garden hose that flattens when empty. At one end of the cover, join the ends with a short piece of hose. At the other, attach an in-line valve. You would end up with a “U” of hose with a valve at the top ends. When you put the cover down, attach a hose to one valve, open both valves, and fill. When the water starts coming out the end, close that valve, give it a moment to pressurise the hose, and close the other. You may still need other weights, but this would probably be good, quick way to keep the edges down tighter. You could also just run the hoses through the edge holes of some snow fencing. what a great idea i agree .. but is it only the way to germinate it ? When is the latest you can plant fall crop carrots? And what variety would you recommend for Southern Ontario climate? I have a thought to add to your thinning issue. I have started using my Earthway seeder for carrots but in a different manner. I dilute my carrot seed in fine vermiculite and use a corn or bean seeding plate. In this way you can actually see/monitor your seed/vermiculite stream/drop while planting a more consistent/thin row. My initial try was at 2 tsp of carrot seeds per cup of vermiculite. That was still too thick. Next i am going to try 1 tsp/cup. I wish i had a little more supporting information to share on this method but i feel it has great potential for planting carrots or any other small seed varieties. With this method the inaccuracies of the Earthway seeder is lessened with the pre-diluted seeds. If the seeder happens to dump more than is expected for a particular seed plate it will not have as great an impact as when seeding with pure seeds. I use a PJr. #300 to plant carrots and have great success. I thin mine 50% with Espoma kelp meal, which is essentially “inert” when compared to other seeds, rice, etc. It acts as a carrier and helps improve the flow of the seed. I do not have to thin. I also use the brush wheel agitator instead of the other metal types that come in the #300 seeder. I’m in NC, USA on very sandy soil, so crusting is a major problem here most of the time as we get some pretty heavy rain. I feel that the split wheel on the rear of the PJr. is really the key–making the soil convex and leaving a little zone of uncompressed soil at the top of the hill to aid in emergence. I no longer have to cover my soil to prevent crusting. Its almost like magic. I do this on about 1000′ of beds with 3 rows/bed every spring and fall. With a landscape cover you really don’t need to have to deal with thinning! It takes several plantations but getting the amounts right like Marty said is the most cost-effective way of doing it without expensiveequipment like Tom K mentions! Miss you Mike! Friday night “surfing” just hasn’t been the same. Hope all is well with you…look forward to the next update. Missing your posts! And as a frequent reader for years I worry a little. What is going on? All the best from our Tiny farm in France. Keep the posts coming:)!Waiting for the next post! The blues and whites, yes! So surmmey and cool and refreshing. Can’t wait to see what you do. @Sasa: Wish I could deliver you one of those doughnuts! @Brian: I had totally meant to mention my trouble keeping my hands off the cherries. That’s why you buy twice as much, and only plan on half of them making it into the salad. :)And thanks, all, on your kind words with regard to Etsy! So exciting. Good technique for carrots but In burlap which kind for fabric you are using so that that will prevent the moisture and cant be tear easily ? Mike, been reading your posts for some time! Hope they return with more frequency! Meanwhile, I experimented using a different version of this technique after reading this post– we see hot dry winds all summer, making it almost impossible to germinate anything we direct seed July-August…I’ve had about a 10% germ rate this summer, including the headaches of going out to the field, dragging hoses, and attempting to find the time to hand water these new beds sometimes 2X a day! 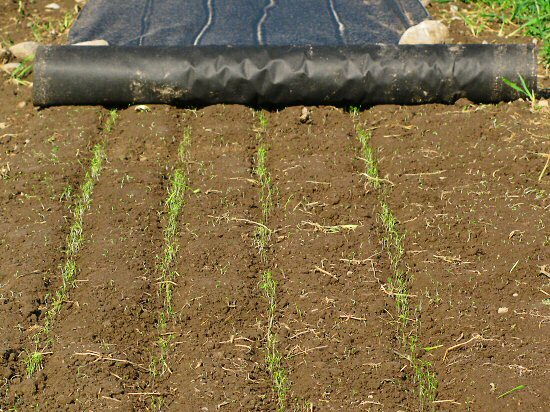 So I was excited to read your post, but here’s what I did– I used our Agribon row cover, since it was handy, and over-heating was a concern for me with the black weed mat. I folded the standard width in half, and it perfectly covered a 30″ bed. I weighed it down with bricks placed every 5′ or so along each edge. It worked great! Not as fast, I’d say 90%+ germination by about the 6th day…but no legginess due to lack of sunlight–the bed stayed moist, though I did water right through the fabric a couple of times because I wanted to get new seedlings more than test how long the fabric would keep the soil beneath adequately moist. The white agribon allowed enough sunlight through that the baby carrots were not leggy in the least. I think this would be a good use for the rowcover that is getting past its prime, but not quite shredded enough to throw away. How awesome! I plan to use this now for all mid-season plantings of direct seeded crops like mesclun, beets, chard, etc., though I’ll continue to monitor the soil moisture below since I suspect that it would dry more readily than with your weed fabric. Thanks for the great ideas, and happy fall! Allison: That’s a great idea!! We’ve had from extremely to fairly wet summers these last three years, so I haven’t tried landscape fabric in hot, dry conditions. Before that, I was using burlap, which is a lot more porous and forgiving of heat. A while back, I did try plastic IRT mulch, which is similar to black plastic, in hot weather, and that worked quickly, but you had to check 2-3 times a day once germination started, because it was pretty hot under there and you could see the first ones up wilting – but I think germination started in just 5-6 days! So I’m gonna save a lot of the damaged row cover that I was planning to give away to be cut up for home gardens, and try that out whenever it looks like hot and dry. For the rest of the time, whatever extra heat is generated and trapped seems like a plus. Anyhow, cool, thanks for sharing!!! I wish I could complain about thinning carrots. Poured a couple of different varieties into my seed bed. Now I have to tell you that there aren’t any carrots. NOT ONE! A friend planted the same kind in his garden and guess what-NOT ONE. So we won’t buy seed from C-n-dian T-Re again. (Not sure if we can list where we bought the seeds). I use the Earthway seeder for carrors, and never thin them before harvest. I get a mix of smaller and larger carrots at harvest time, but on the whole they are nice carrots–not spindly and weak. I suppose it will really depend on soil type how well this works. I make 6 rows to a bed, basically as close together as the seeder will allow and then I germinate with a long run of micro-sprinklers and then switch out for drip tape when the plants are maybe 3 inches tall. I like the idea of covering the row for germination. I take it you soak the bed before, then cover it until germination…maybe wetting the cover as needed depending on temperatures and humidity? Like I mentioned, I currently just use the micro-sprinklers which allows me to keep it pretty uniformly moist all the time… but it does require me to be around to spritz the bed several times a day every day until germination. I’d be interested to learn if anyone else has had luck covering for germination on a (semi) large scale, or if anyone has any other ideas. What scale are you doing your carrots at? We do a couple successions of about 75-100 foot rows. We’re growing for market and a 30 member CSA which we’re growing a little each year. Love your blog and am going to try to stay more regularly tuned in. We are planning on our winter crops. We had some carrots this summer but they were all short. Do we need to till the beds very deep for carrots? We do mostly hand tilling in our greenhouse. To Jay, I’d say you want to till as deep as you want your carrots to be long. If the soil become dense at any point in the root’s growth, it will most likely take the path of least resistance and stop lengthening downwards. So the fluffier your soil can be in the first foot of depth, the better. Mechanical tilling does a better job of this (I use a BCS walk-behind tractor), but if you put in some time you can get the same result with hand-tilling if you’ve only got a small area to plant. Totally different climate zone here but I started my fall crop of carrots just the other day. I did it right into the soil last year and I somehow avoided thining by seeding them pretty thin to begin with. This year they’re growing in a big ol’ pot and I know there will be thining involved. Wow great post! That cover looks pretty heavy duty. 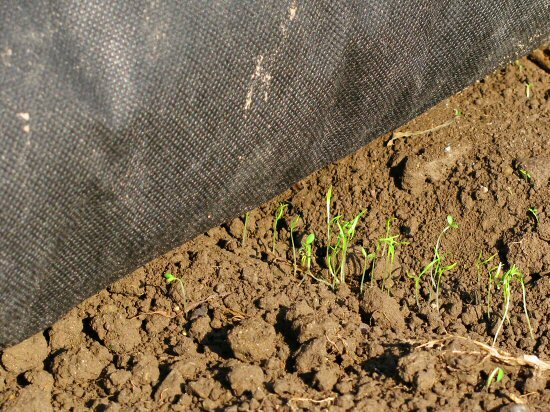 We used a cover for for our lettuces…to protect them from critters and it worked pretty good. We haven’t lost one to bugs yet. I added you to our blogroll at http://www.themorningdewfarm.com and was wondering if you would return the favor. We just went online and have been selling at farmers markets in Cincinnati. I’ve always wanted to try carrots for once but is very hesitant as I’m not sure if it will germinate or be a success. I’ve been doing gardening for three years now. I’ll just have to try this great idea next year. What a great idea for getting carrots to germinate I will definitely give it a go next year as I always end up have to sow two or three times the number of rows I want to just to get a reasonable number of carrots. I love your idea of a farm. I like in town, but my dream is to have a farm in a mountains village. I have never germinated carrots like this. We just put them in the ground and water well. This does seem to have its merits though. Can the canvas cover also be used to take the plants to maturity if you cut holes in it for the stems to come up? I would think that would cut down on the weeds. In response to Chuck, I bring in a moist layer of leaves to my veggie beds after the seedlings are up, and just plant it so thickly with a mix of crops that weeds aren’t a problem. I know some people think veggie beds should be free of leaves, but I love this method. We’ve never had any great success with carrots. I hope this method gives you a great harvest though. I’ll be interested to follow your progress. Looks like a successful germination, thanks for sharing the pics. Seed sowing is the first step towards gardening. Gardening is a beautiful habit and hobby to follow as it gives content to the heart and peace to the mind. Even I have a small garden in my backyard but it is a pond garden. Great idea, also old floating row covers work great as well. I use an Earthway seeder to sow about 2000 feet of carrots, usually in early July for fall harvest. Yes, thinning is a severe task, but the low cost of bulk carrot seed- once you buy about 4 ounces- outweighs any other concerns, and by then you can’t risk a thin stand, so I seed heavily and thin aggressively later. I’ve read that the old-timers used to cover a carrot row with planks until they germinated, and you are describing what is essentially the same trick: trapping moisture in the seed bed with a barrier on the surface. I use a different trick: I water the furrow one time at planting, then use a “dust mulch”, by dragging a leaf rake, turned upside down, over the furrow every few days. The soil itself is the barrier. I’ve had germination in as little as 4 days this way! They sprout really well in the summer heat this way, utilizing the latent soil moisture and the rapid transpiration from under the furrow.